Samsung is wooing people by going for evolution. Its best Android Smartphone gets even better with this new model-Samsung Galaxy S5. 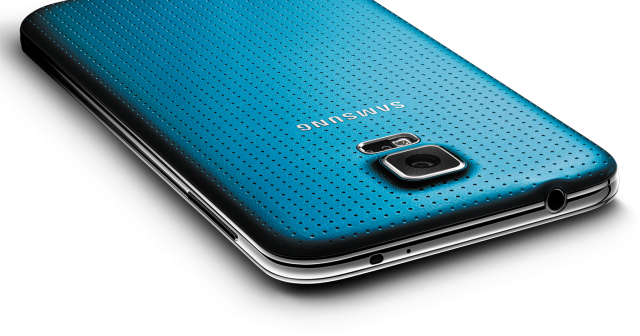 The company announced the Galaxy S5 Android Smartphone at Mobile World Congress 2014 in Barcelona, Spain. This device has a 5.1-inch display at 1080p and is powered by a Snapdragon 801 processor at 2.5 GHz. The camera is determined to give clearer, faster images. It also possesses a fingerprint scanner which is referred as the most secured feature of this phone. Likewise S4, it is also running on Android 4.4.2. 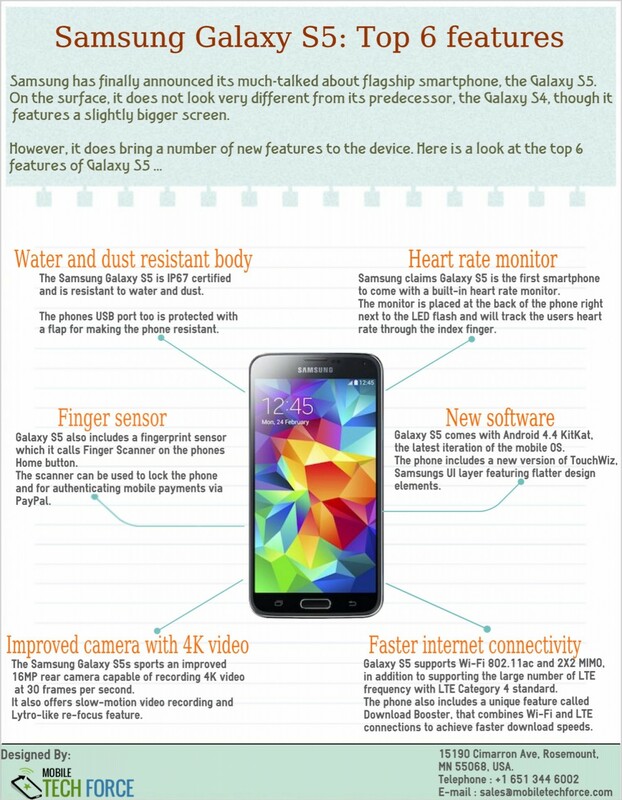 The Galaxy S5 has inherited the IP67 rating of the Galaxy S4 active. We can submerge it for a short time. The screen is bigger and brighter, altered design and processer is quick. This time, Samsung has introduced some classy design language for their Android version known as Touch Wiz. Now, things are more flatter, more dynamic, more polished and features like heart-rate, monitor and fingerprint scanner has given a unique experience. The spec sheet has a 2.5GHz quad-core CPU, 2GB of RAM, a 2800mAh (removable) battery, 16/32Gb of memory of which 128Gb is of external memory and screen resolutions extended to 5.1-inch and added biometrics. It has promised a “fashionable” and “glamorous” design, a classy camera and a water-resistant device. It comes with a Snapdragon 805 CPU and a WQHD screen which is the highest end feature that one could ever ask for. You can now swipe a thumb sideways across when the things work. However the accuracy is low. The screen of this device is something to admire on and is the best feature of the phone. Its even brighter than some LCD panels and it looks more vivid when the power is full. And it is still pin sharp throughout. The full HD super AMOLED screen delivers 22 per cent higher brightness than the Galaxy S4 without shutting down anymore power. Samsung has filled up the Galaxy S5 with all manner of settings that allows you to find the exact balance of what you want to do. And features like Adapt Display are extremely excellent. It makes sure that even if the light is brighter, the screen is clear. Price be like $650+ in the U.S. and AU $990. It is a bit cheaper than its counterparts. The high brightness, exquisite sharpness and better color reproduction is highly impressive. But the most exacting of all standards, if you are willing to spend a large amount of time on your phone screen just for movies, internet browsing or just flickering through photos, this 5.1-inch 1920×1080 option is the best option for you. The interface is quite an improved one. The lock screen is the first place to get over dragged with addition to weather and pedometer. This device has got a camera swiper in the corner too. The animation transitions between home screens are a bit slow but it is ignorable. However, there is no such change to be seen in the settings. Depending upon its features and usage, it’s a 4 star phone. The fact that it has got the best screen, outstanding battery and high-end specs combined together. It is a decent phone that one should buy.